Town boss Jamie Fullarton hopes the club’s youngsters will learn some lessons from their 4-1 West Riding County Cup defeat at Ossett United. 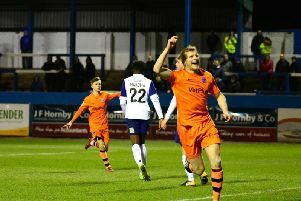 Phil Hughes and Steve Nichol took charge of the game, as they have for every County Cup clash this season, but were unable to prevent Town, who fielded a mixture of first-teamers such as Josh Staunton, Shaun Rowley, James Ferry, Ryan Sellers and Jacob Hanson, with some youth-team players, from crashing out. “Such games have two advantages; you’re looking for players that haven’t played regularly in the first-team to get some game-time, which a few of them did. “And then you’re looking at the young players from the academy to see if they can make the step up,” said Fullarton. “It’s a great opportunity for them to play in senior football with our first-team squad players against a men’s team.